The Cape Vest is made of two layers of weather resistant, 1000 denier nylon/urethane coated fabric. This fabric is solution dyed and will not bleed the color of the vest. 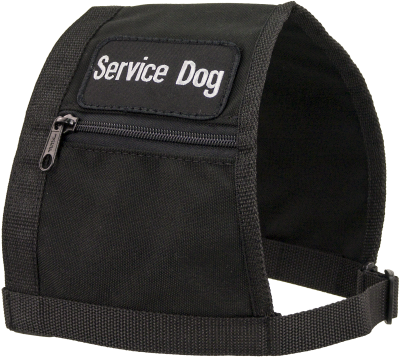 Your K-9 partner will be highly visible and recognized as a working dog. The cape vest fits over the dog's head and attaches around its girth with a quick release snap buckle. The chest strap is adjustable. On one side, there is a zippered pocket. The other side has a light weight plastic snap which is handy for attaching an ID tag or badge. We also have ID badges available (in several materials and styles) which identify your dog. The vest comes with 1 patch of your choice (not specialty patches). Additional patches can be purchased, and we will sew them on for you FREE of charge. Please specify where you would like your patch(es) located on your vest in the “Patch Placement” field in the shopping cart. e.g. Service Dog patch left, middle. This cape vest is designed for light duty work and comfort.